• This control determines the fuel injection quantity by adding coolant temperature, fuel temperature, intake air temperature, and intake air pressure corrections to the basic injection quantity. The engine ECU calculates the basic injection quantity based on the engine operating conditions and driving conditions. • The calculation consists of a comparison of the following two values: 1. 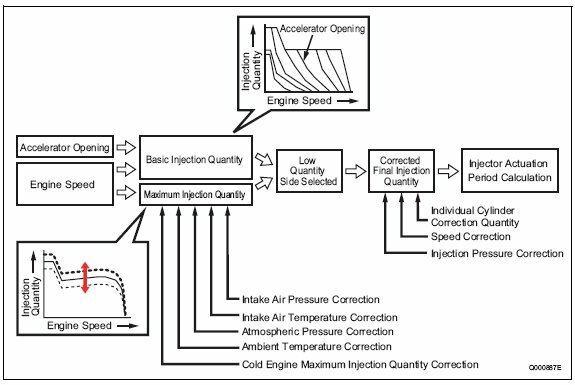 The basic injection quantity that is obtained from the governor pattern, which is calculated from the accelerator position and the engine speed. 2. The injection quantity obtained by adding various types of corrections to the maximum injection quantity obtained from the engine speed. The lesser of the two injection quantities is used as the basis for the final injection quantity. accelerator opening increases, the injection quantity increases; with the accelerator opening constant, if the engine speed rises, the injection quantity decreases. This is determined based on the basic injection quantity for when the engine starts up and the added corrections for the starter S/W ON time, the engine speed, and the coolant temperature. If the coolant temperature is low, the injection quantity is increased. When the engine has completely started up, this mode is cancelled. pressure, atmospheric pressure, and full Q adjustment resistance (only for the 1st generation HP0 system), etc. When the intake air pressure is low, the maximum injection quantity is restricted in order to reduce the emission of black smoke. The maximum injection quantity is increased and decreased according to the atmospheric pressure. When the atmospheric pressure is high, the maximum injection quantity is increased. During acceleration, if there is a large change in the accelerator pedal opening, the injection quantity increase is delayed in order to prevent black smoke emissions. The full Q resistance is for correcting the injection quantity for a full load. The maximum injection quantity is increased or decreased by the car manufacturer to match to standards. There are 15 types of full Q adjustment resistance. The appropriate one is selected and used.